WOW! First, many apologies for taking so long to add another post! How can it be mid-April already?! Here is a quick summary of what has kept me away these few months. We have redone our home office- including my craft/bead stuff but I will address organizing such things another day. We did our taxes We had a big family birthday party to celebrate my great nephew, 6, and my husband, 60, on the same day- FUN! I had a birthday where my unicorn tendencies were fully celebrated. We planned a closet makeover for the master bedroom and had it installed. Lots of sifting and sorting of things stashed in there since we moved in three years ago and learning some organization skills. OH! Fired the neurologist I thought was helping me with my rare health issues but suddenly wasn’t. Once again my primary care physician and her referral coordinator stepped up for me and got me in to see a specialist at Emory quickly. I really like the new doctor and we are adjusting my medications so she can re-evaluate my situation in June. WHEW! NO wonder I didn’t post here! I think I can start getting back to posting more now. Getting back to my creative journey…. 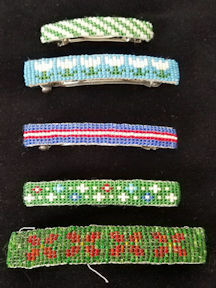 First Works: Loomwork Barrettes, 1995. Created by Melanie T. Robbins. Well worn by the Robbins Girls. In the Straybeads Collection. “The Beginning of the End” Created by Melanie T. Robbins, 1995. Mandela from Carol Wilcox Wells’ Creative Beadweaving. now in the Straybeads Collection. It came out great. My girl was happy, my promise to her fulfilled and , umm, I. was. HOOKED! This is where my beadwork journey started. So, I kept learning more and more and making my own patterns. My head was overflowing with ideas of what to do with those teeny, tiny seed beads. I loved it! More about learning my new hobby next time.